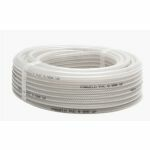 Clear PVC hose with braided re-inforcement. 6mm bore x 1.6mm thick wall. Sold by the metre.